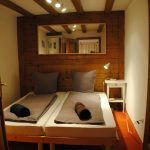 One of the best spots in town – just 25 metres from the slopes! 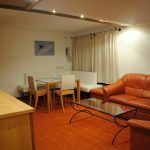 This is a large four bedroom, well proportioned apartment with a small balcony. It will sleep 8 people. It has a spacious lounge / dining area with a large corner sofa. There is also a separate kitchen. 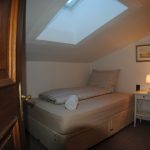 The apartment is very well equipped and is an ideal apartment for couples or a family. 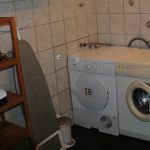 In the apartment you will find a washing machine, tumble dryer, dishwasher and much more. Unlimited wireless internet is also included in the cost. 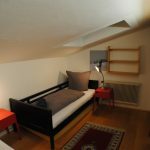 In the entrance lobby there is ski storage and heated ski boot storage – all included in the price of this apartment. 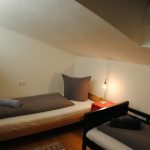 All in all apartment 3 is an ideal place to base yourself for a great holiday in St.Anton. The main living area is large and features a large corner sofa in front of which is the 32″ LCD HD TV. There is also a DVD player and UK Sky plus HD box that has all the sport and movie channels. There are skylights in the ceiling as well as a large double window that let plenty of natural light in making the living area well lit and spacious. For dining you will have an extendable table with 4 dining chairs and a large corner couch that between them can seat up to 8 guests. 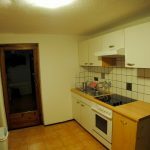 This apartment has a very good kitchen with fridge/freezer, oven, dishwasher, microwave, egg poacher, slow cooker and toaster as well as plenty of cupboard space. This is a separate kitchen, not one that is incorporated into a living area. It is fully equipped with everything that you need to cook a three course meals! There are four bedrooms each with good wardrobe and storage space. 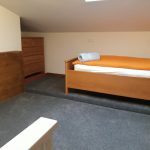 Three of the bedrooms come with two single beds and the third bedroom has a standard double bed for 1 person or a couple. There are two bathrooms, one has a modern shower and the second a bath, there is also a washing machine a dryer. 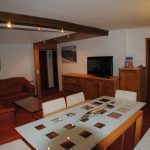 This apartment is just 100 metres from the lifts to all of the ski areas meaning that the slopes and si school are literally on your doorstep. 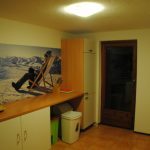 You will also be just a one minute walk from the centre of St.Anton where all the bars, nightclubs and restaurants are – close enough to enjoy yourself but not so close as to be too noisy! You are also very close to the Swimming Pool, Wellness Centre, Arlrock (climbing & bowling centre) & Tourist Office. All of this makes this apartment an ideal place to stay if you have children. The railway station is 150 metres away.